Storing waivers is just the beginning. We believe that nothing should be wasted, including opportunities to build valuable statistics and keep in touch with customers. 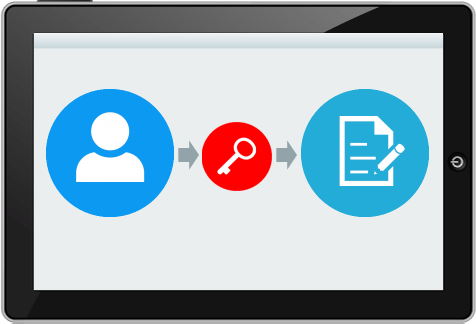 In other words, Waiver Saver will transform your waivers from a PROBLEM into a TOOL. Who Can Use Waiver Saver? From surf schools to sleigh rides to ATV tours, just about anything that’s fun requires a waiver! 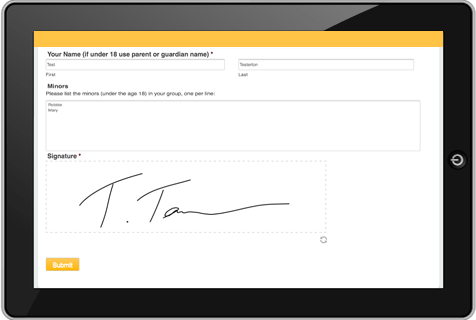 Permission slips can be signed by parents, and verified by teachers, all online and in real time. 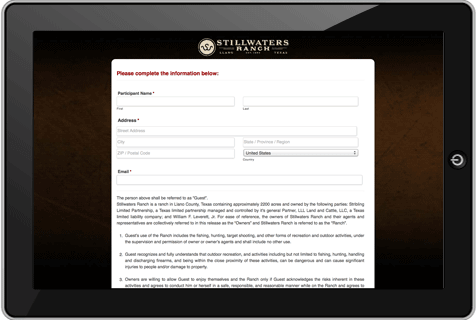 Create professional digital waivers that clients can pre-sign online, or upon arrival at your space. 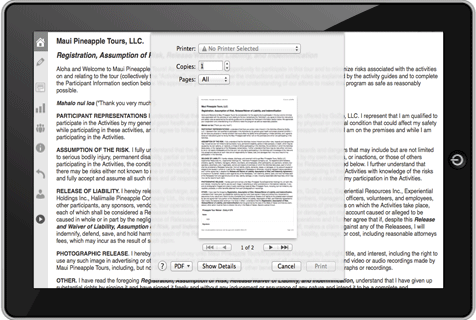 Use Waiver Saver as a template engine for contracts. Say goodbye to stacks and stacks of contracts, as well as the need to fax back and forth. (Some are zoomed in for clarity). Want To Keep In Touch With Customers? Waiver Saver’s most powerful secondary feature is the ability to keep stats right out of the box. When enabled, this feature inserts a final “How Did You Hear About Us?” selection – with which your customers will indicate how they found you. 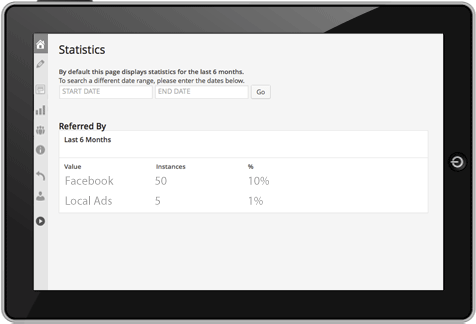 What better way is there to audit your advertising efforts? 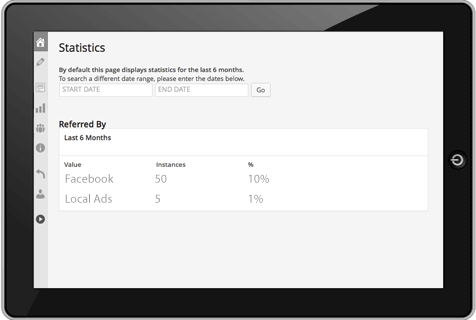 You have full access to the choices that appear under this section, meaning you can add/edit/delete the options to reflect your current advertising strategy. Every Waiver Saver installation comes with a public link that allows your customers to pre-sign their waiver prior to arrival. This is a very helpful feature for large events, or for organizations that run a “check-in” prior to their event. To verify that someone has in fact pre-signed, just search for their name in the easy-to-use archive. Waiver Saver search results are fast and accurate! Waiver Saver can AUTOMATICALLY add customers who sign a waiver to your Mailchimp or AWeber accounts (note Constant Contact integration is no longer available). No need to sync or import lists manually (unless you choose to do it that way). For organizations that require multiple documents per signer, we have good news for you! 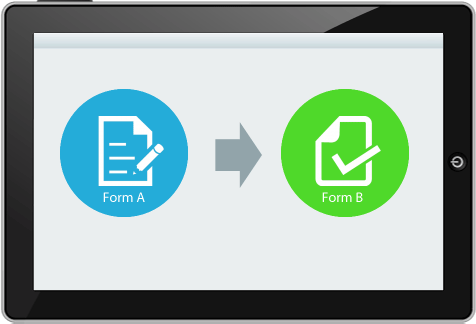 Waiver Saver is capable of performing document “flows” in which one document leads to another. If documents share common fields (such as a First and Last Name) the system will populate those fields throughout the chain of documents, eliminating the need to re-type information over and over. You have the option to restrict access to registered users only, and to further restrict access to certain documents based on user permissions. This is perfect for private organizations or for schools that need to separate the experiences based on the user’s level. 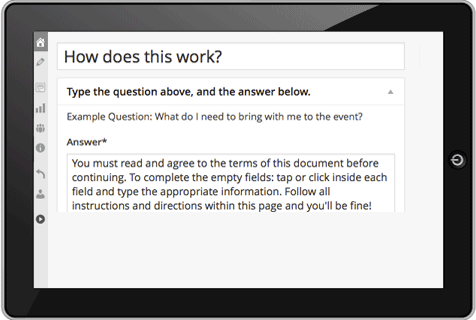 For example, they may want to tailor the functions based on whether it is a teacher or a parent that is signed in. You can also set limits like total signups allowed, as well as the date range that a waiver is available for signing. The following features may be added to your account for an additional cost, which will depend on monthly volume. 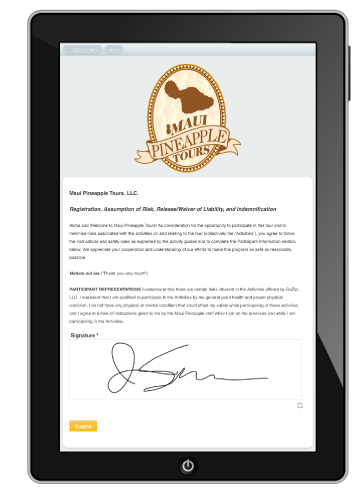 Receive an email whenever a customer signs a waiver. Or, automatically send your customers an email after they sign. The email may include coupons, social links, or anything you want! Allows guests to give you instant feedback regarding their experience. Allows owners to identify and address areas of customer dissatisfaction before they turn into negative reviews on TripAdvisor or Yelp. You can use the tablet’s built-in camera to attach a photo of each person that signs your waiver. When combined with the traced signature, this makes it virtually impossible for anyone to claim that they did not sign. THIS FEATURE IS COMING SOON! SWEET! You rock. I saved hours this weekend, Seriously Great Work! This is so cool - I love it! Very friendly & easy to move around the system. We love Waiver Saver! It saves us time, and has freed up lots of office space. *Base price. Actual price of Corporate Plan depends on volume. 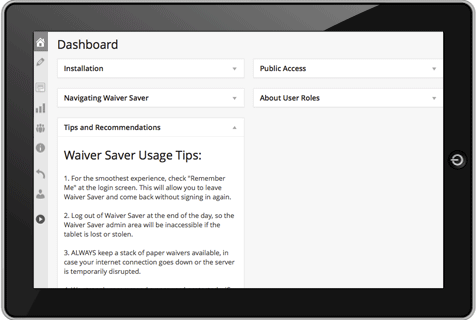 Waiver Saver can save you hours of data input. Advanced setups can connect with almost any 3rd party customer management system, so a Waiver Saved is a Customer Made. Waiver Saver is a “Storage As A Service” application, meaning customers pay a monthly fee to store digital document records on our servers. Waiver Saver works just like a paper waiver…minus the paper! We digitize your waiver so that it is accessible via tablets, smartphones, and even laptop/desktop devices. 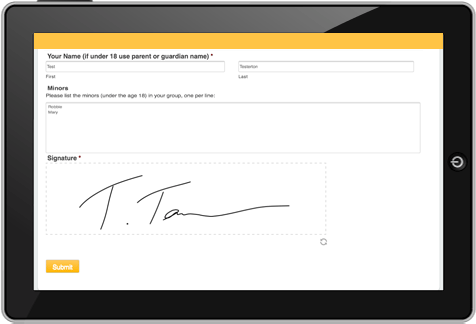 Your customers fill out their information and trace their signatures as normal. Yes! Waiver Saver records are legally binding documents, but we do advise you to confirm that your state does not strictly prohibit digital contracts. (We have yet to hear of state that prohibits them). Yes! Waiver Saver documents are SSL encrypted and transferred via a secure connection. Our server is monitored 24/7. Yes, many times. We even have backups for our backups! How do I look up and print signed waivers when I need them? Simply go to your admin area and search via name, date, dob, etc. The matching records appear and will give you the option to print! SAVING TIME. Waiver Saver includes an option that allows your customers to pre-sign their waivers online, making the following check-in process much faster! Also, your employees will no longer need to collect/file the waivers; nor will they need to search through endless stacks of paper to find a particular record when one is needed. Our searchable archive makes finding and printing waivers a snap. SAVING PHYSICAL SPACE is another huge advantage to using our Waiver Saver digital waiver solution. Many states require activity agents to retain waivers for a period lasting several years (for every customer!). This results in cluttering valuable office or home space with boxes of waivers. Imagine what you could do if you freed up that space! SAVING TREES – and we know it’s just not cool to needlessly waste resources like ink and paper. If you are an earth-conscious activity provider, then Waiver Saver is for you. Can I sign documents with Waiver Saver on my smartphone? What about my office computer? Yes, Waiver Saver is accessible on virtually all modern smartphones, tablets, and even laptops/desktops! For smartphones and tablets, the customer traces their signature directly on the screen with their finger/stylus. For laptops and desktops, customers can trace their signature via the computer mouse. Can my customers pre-sign their waivers online? Absolutely! Once a reservation is confirmed, you may instruct the customer to sign online. Later, when it is time for the customer to check-in, a glance at Waiver Saver will let you know if he or she has signed their waiver. You can stop service at anytime, and we’ll provide you with your full archive of records in CSV format. It’s your data! Do you offer any products for medical records? Yes, tech support is always available to our customers via email. But it's time to break up with your paper waivers and try something new & exciting.